While Tel Aviv is notorious for its nightlife, culinary scene, beaches and all things secular, Jerusalem is more commonly associated as a religious sightseeing destination. But dig beneath the Tel Aviv surface and you’ll discover a world of interest & wonder with the sheer number of incredible churches open to visitors. 15 Beer Hoffman St., Jaffa. The Immanuel Protestant church is located in the newly gentrified American–German Colony. Serving a small Lutheran congregation of Norwegians sent to Israel by the country’s Church Ministry, the building dates back to 1904. A beautiful church, its walls are built from two kinds of natural stone with a roof adorned in Marseille tiling. 1 Mifratz Shlomo St., Old Jaffa. From the seafront promenade of Jaffa’s Old City, the ascent to St. Peter’s Church and Monastery is simply breathtaking, proudly perched on the city’s most beautiful viewing spot. First built in 1654 by Roman Emperor Frederick II, and since destroyed and rebuilt twice, this Franciscan church honors St. Peter’s resurrection of Tabitha, a disciple of Jesus, famed for helping the city’s poor. 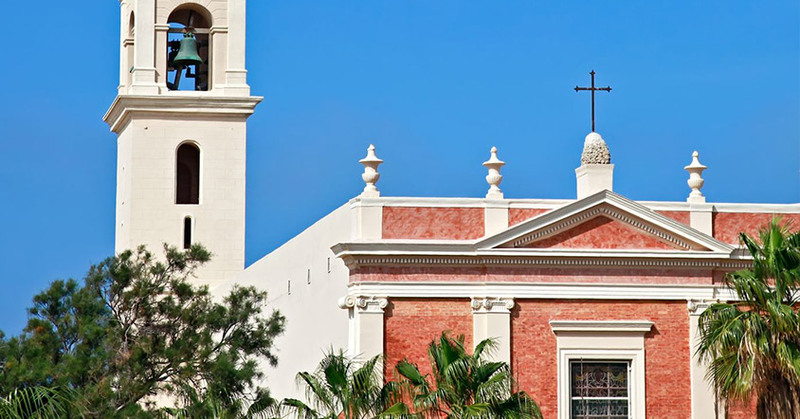 With its distinctive Baroque exterior, St. Peter’s was and remains the most imposing building in Old Jaffa, acting as a beacon for millions of Christian pilgrims, who arrive to the Holy Land by boat. Open to the public every day from 08:00h to 11:45h & from 15:00h to 17:00h, St. Peter’s, which coincidentally sits next to the Vatican Embassy to Israel, conducts mass in Hebrew, English, Polish and Spanish. If you’re looking for something different, head to the shabby chic Florentine neighborhood. Famed for its interesting mix of hipster bars and art studios, it is also home to tens of thousands of international workers and therefore thriving, diverse religious communities. In short, the choices are wide-ranging and wonderful and waiting to be discovered.